I tried to go to Finland this past December but it was so last minute I couldn’t make it work in time. I have always dreamed to be in a place like Finland over the Holidays- Rudolph, sleigh rides, Santa’s home, Northern lights- it always seemed so magical to me and what more of a perfect time than to go over Christmas and the holidays. That is obviously the busiest time of year just like most places so I decided to plan a trip for February instead which is also considered peak season there, and you still get the beautiful snowy winter vibes. I went for 9 days and stayed at 5 different places, so I got a really well-rounded feel of Lapland. In this blog post I will share my full itinerary, list my recommendations and tips, and share where I stayed. Finland is a magical place and I would recommend it as a travel destination to anyone. There are many reasons to visit Finland- I found the Finnish people to be very nice, there are lots of fun activities to do in the winter (or any time of year), and the landscape and scenery is truly breathtaking. I also can’t forget the most exciting part, it’s an amazing place to visit to witness the Northern Lights which I was so lucky to see while I was there! We flew into Helsinki from Los Angeles (on Delta with a stop in Amsterdam), and bought a separate flight flying straight from Helsinki to Rovaniemi which is Northern Finland. We spent all of our time in Northern Finland/Lapland. The flight is only an hour to Rovaniemi from Helsinki and there are cheap options. We flew that flight on Finnair. We rented a car for the entire time we spent in Lapland. Pretty much on every trip I rent a car because it gives me the flexibility and freedom I need to do what I do. I’m a big advocate of renting a car if someone is able and feels comfortable driving in a foreign country. You really can do so much more and on your own time. It is the most convenient option for me, but I can understand that it can get pricey in certain countries so it might not be the best option for everyone. There are some countries that have easy public transit more than others so that can sometimes be a less expensive option. But if you can find a good deal I personally suggest the rental car option. Our rental car for 9 days in Finland was $572.00. Note: Most accommodations in Northern Finland include breakfast and dinner in your stay. We really didn’t have to pay for any outside meals and ate at our hotels for the majority of the time we were there. Breakfast was always a buffet, and dinner was either a buffet or a specific and limited menu for the included dinner. Also most every hotel offers activities such as snowmobiling, husky safari’s/dog sledding, Finnish spa access, reindeer farm visits etc. We arrived in Rovaniemi around 6pm and decided to stay in Lapland’s capital after a long travel day from Los Angeles. We stayed at Santa’s Igloos Arctic Circle which was only a quick 10 minute drive from the airport, located at Santa Claus Village. We stayed in a luxurious glass igloo which was my first ever igloo experience! It snowed that night and we woke up the next morning with snow on the roof of our igloo. You can press a button inside the room to heat the glass windows of the igloo to melt the snow so you can see out the windows. Pretty cool! The igloo was really comfortable and we enjoyed our stay the one night we were there. 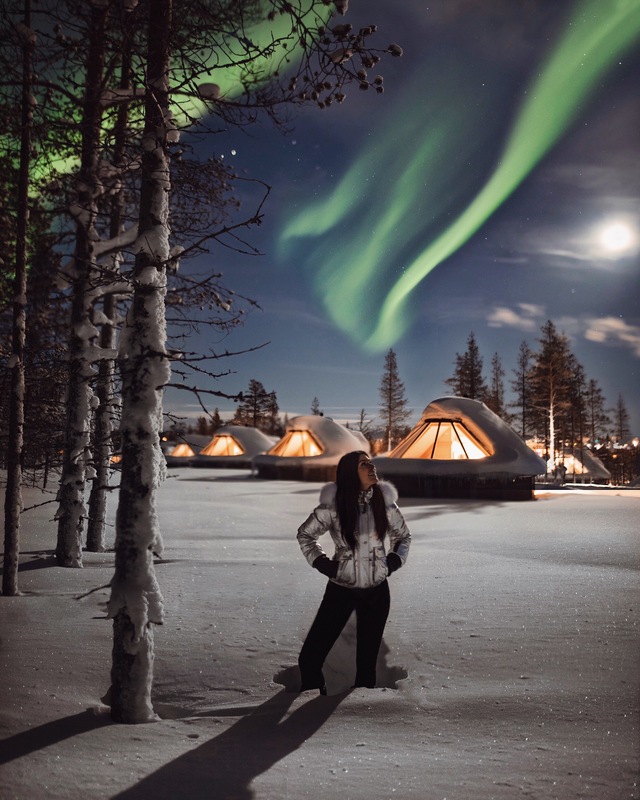 This place is a great option to stay in Rovaniemi and although it’s near the airport and close to town, it still gives you the beautiful nature vibes you want when you’re staying in a glass igloo. After our first night in Rovaniemi, the next morning we drove 3 hours north to Northern Lights Village. The more north you go, the more chances you have to see the Northern Lights. We were told we were coming at a good time because the lights were supposed to be very active the week we were there. It was at Northern Lights Village where we experienced seeing the Northern Lights for the first time! Locals even said it’s rare for them to see lights and its always a special occasion when they do. Apparently there were no lights the few weeks before we came and we got so lucky to see them on our 2nd night in Finland! We stayed in a cabin with a glass roof and got to watch the sky light up from the inside and outside our cabin. It was such an incredible thing to experience- I was screaming like a little girl with excitement when streaks of green popped up all around us in the sky. The hotel (and most hotels in Lapland), give you an Aurora alarm clock that goes off any any point in the night if there are visible lights in the sky. We saw our first aurora at around 11pm on the first night we arrived at Northern Lights Village. We ran outside of our cabin to take pictures as fast as possible. We also set up a time lapse inside our cabin so while we slept we had it record all the sky movements through our cabin roof widows. It was a challenge to shoot, but we did it! As soon as you set up the camera on the tripod for the shot, the lights move and disappear so quickly the sky it was hard to catch in time and we kept having to move to different locations with the camera and tripod super quickly. Not to mention because you are shooting in low light you have to be extremely still and can’t move for 10-30 seconds. It definitely was a challenge but we pulled it off with lots of trial and error! Our pictures turned out great. Seeing the Northern Lights is one of those experiences you just can’t quite put into words. You’re in awe that nature can do that and it can be that beautiful- it’s surreal. We saw Northern lights the next night as well. We really lucked out. There were so many moments I just stared up at the sky in awe. I’ll never forget my stay at NLV- it will always be the place I experienced seeing the Northern Lights for my first time! This is probably one if not the most famous resort in Lapland. It was the place I had seen in pictures that made me want to visit Finland. The igloos are made of 360 degree glass to give you the full glass igloo experience. We only stayed one night here, and to be honest it wasn’t my favorite igloo accommodation. There are no showers inside your igloo- you have to walk to a communal bathroom area if you want to shower. There is just a bed, a toilet and a little extra space to store luggage. It’s definitely very basic and small, but an authentic igloo experience nonetheless. The igloos are all heated so they are warm inside (got lots of questions regarding this on my Instagram- people thinking it was cold inside the igloos). One night was definitely enough for me here, but I’m glad I got to finally check this place off my bucket list! This was my favorite igloo accomodationI stayed in. Located in Ranua, Arctic Fox Igloos is less than a year old and the most luxurious and spacious in my opinion out of all the places we stayed. The bathroom was in its own separate corridor from the bedroom and there was plenty of extra living space for luggage storage and other things. I loved the vibe of this place and it really felt like a luxury igloo experience. My igloo was located at the end near the woods with a beautiful view of a frozen lake bed and it felt secluded and private. Aside from igloos, Arctic Fox Igloos also offers luxury cabin accommodations which are perfect for big parties and families. It was through Arctic Fox we did mostly all of our winter activities such as Snowmobiling, a visit to a Wolf Dog farm in the woods, went on a husky safari (dog sledding), a reindeer farm visit, Aurora searching at night on a Finnish horse sleigh ride, and a visit to the Ranua Wildlife Park to see polar bears and arctic fox. We were kept very busy and had some of the most amazing experiences of our lives! I have to mention that our dinner and breakfast there were very good as well. I definitely recommend staying here in Finland. A big THANK YOU to Arctic Fox Igloos for putting together an epic itinerary for us- memories to last a lifetime! Located in Kemi, we stayed at Seaside Glass Villas the last two nights of our trip before heading back to Helsinki for our flight home. We stayed in one of their contemporary seaside glass villas set alongside a frozen lake and next to an ice castle. Kemi is a town that felt more like a small industrial city and it had a completely different feel in comparison to the remote nature experiences in the woods we had prior spent in cabins and igloos. Kemi is best known for the Icebreaker Sampo Cruise on the Baltic Sea which was one of the most unique travel experiences of my life and a definite highlight from my Finland trip. Snowmobiling- Courtesy of Arctic Fox Igloos & Wildlife Safaris. My first time Snowmobiling and it was such a rush! I loved it. We went on an excursion in Ranua to a wolf dog farm which was an hour each way and back. It was awesome going through the snowy woods and beautiful landscape. It’s like a jet ski on snow! Wolf Dog Land- Courtesy of Arctic Fox Igloos & Wildlife Safaris. Susimaa Lapland is run by husband and wife Sarah and Harald who moved to Finland from Austria to raise wolf dogs in the woods in Lapland. We got to hang with the dogs and learn about their lifestyle which was quite interesting. They are considered dogs with a small mix of wolf but they look exactly like wolves, and have wolf eyes! They have plenty of space in the woods and are well taken care of. I was fascinated by Sarah & Harald’s way of life- they barely use electricity and live such a simple life. Definitely a cool experience to see such a different way of life and to get up close and personal with wolf-like creatures. Night Aurora Searching on Finnish Horse Sleigh Ride – Courtesy of Arctic Fox Igloos & Wildlife Safaris. This was magical. We departed at 8pm with a beautiful Finnish horse on a sleigh (it wasn’t heavy for the horse we glided very easily on the snow), through the woods with the most amazing view of the stars and the night sky. We didn’t see any Auroras that night but we set a fire in the middle of the woods with some warm berry juice and good conversation. It was a really beautiful and special night. Husky Safari- Courtesy of Arctic Fox Igloos & Wildlife Safaris. My first time ever dog sledding, and what an experience. I was giggling the whole time it was so much fun! The husky’s were so cute and loved to run together. Whenever we stopped they were antsy to get back to running again. It’s important for me to know that the animals are enjoying themselves and not unhappy in anyway. Definitely an activity I recommend doing in Finland. Reindeer Farm Visit- Courtesy of Arctic Fox Igloos, Wildlife Safaris & Vaaran Porotila. Another highlight on my Finland trip. My reindeer dreams came true! We visited Vaaran Porotila Reindeer Farm in Ranua. It is a family run business that has been passed down 5 generations. They have over 300 reindeer they care for. It’s located in the middle of the woods and the reindeer are separated in different pens with lots of space to roam around. They even let them free at one point in the woods and the reindeer always come back! (They know where the food is lol). I got to get up close and personal with the reindeer and feed them and even went on a short sleigh ride. It was so interesting to learn about them and the family who has run the farm for many years. Ranua Wildlife Safari/Zoo- Courtesy of Arctic Fox Igloos, Wildlife Safaris & Ranua Zoo. I visited the Ranua Wildlife Park early in the morning for feeding time for the Polar Bears and Arctic Fox. I typically don’t visit zoo’s but these animals in the Ranua wildlife park are well taken care, well fed, and have lots of freedom and space to roam. We fed the polar bears, and got to get close to an arctic fox and feed him as well. Icebreaker Sampo Kemi- Courtesy of 365 Kemi. Definitely top Finland highlight for me. This was such a unique experience. We spent the day on the Icebreaker Sampo cruise through the frozen Baltic Sea. The ship breaks through the frozen sea of ice, making a path for other ships to get through. During the cruise the ship stops in the middle of the sea so the passengers can’t get out and walk on the frozen water, and can also take an ice plunge and float in a dry bubble suit in the middle of the broken ice! As I mentioned before, we ate most of our meals at our hotels because breakfast and dinners were included, so I don’t really have a list of food recommendations for Finland except one place. We went to a place called Kauppayhtio on the way to the airport on our last night in Rovaniemi for an amazing burger. The place is known for burgers and my burger and fries were really good. It was the perfect last supper to end our amazing trip. Also I have to mention that reindeer is a huge menu staple in Finland. It seemed to be as common as any meat like chicken or cow. You can find reindeer burgers, reindeer filet, reindeer curries, reindeer soup etc- something reindeer on several menus I came across. In fact I saw reindeer burger signs as soon as I landed in the airport in Helsinki. Part of me just didn’t have the heart to try it because reindeer are magical creatures to me (Rudolph! ), but another part of me thought it was hypocritical because I do eat other types of meat, and reindeer plays such a big role in Finnish culture. They use reindeer for everything- from their meat, their fur, their antlers etc., pretty much no part of the animal goes to waste. The reindeer business is a big industry for Finnish people for hundreds and hundreds of years. I have to honestly admit I did try reindeer when I was there- I had reindeer curry for dinner one night. The meat is very lean and a little gamey similar to the distinct taste of lamb. I am very open when I travel and always like to try something at least once, especially if its part of a culture. I visited a reindeer farm first hand as shown above, and saw how the animals were treated and how free they were to roam and live a good life. I’m curious, would you try reindeer if you were in Finland? Leave a comment! Finland was a very special and unique trip for me. I hope to go back there one day, and I hope I inspired my readers and followers to go there too! I’m so curious how did you fit all your puffy jackets in your luggage?? I’ve heard Finland is a “bucket list” country and curious to check it out, being a huge fan of Scandinavia, having been to Denmark a couple of times. Finland appears so different to the other countries in that region, I’ve always thought there’s not much to do other than the Northern Lights but clearly you had a great time with some awesome experiences. I’d certainly try Reindeer as I think it’s good to try a country’s national cuisine. Do you plan on visiting any of the other Scandinavian countries, if you haven’t done so already?